Northern Ireland – South of Enniskillen, in a farm on the border between Northern Ireland and the Republic of Ireland, John Sheridan whistles while herding dozens of ewes into a cube-shaped, metal ultrasound scanner installed in the middle of hilly green pastures. Those who aren’t pregnant will be fattened up and sent to the Republic of Ireland for processing, Sheridan explains. From there, they will end up on mostly Belgian and French tables. Like many farmers, the 57-year-old depends on the frictionless flow of goods, services and people between Northern Ireland and the Republic of Ireland, which are both part of the EU single market. But that seamlessness could end if Britain leaves the European Union as scheduled on March 29 without a deal. A so-called “hard Brexit” would see trade revert to WTO rules, which would impose costly tariffs and border checks where none currently exist. That prospect, says Sheridan, threatens the viability of his family farm. Northern Ireland is highly dependent on trade with the Republic of Ireland, especially agricultural. We are going to be sorely affected in this county. Our youngsters will leave. Northern Ireland will become a wasteland. The food and drink processing industry in Northern Ireland is worth approximately 4.4 billion pounds, and farming alone supports more than 48,000 jobs. 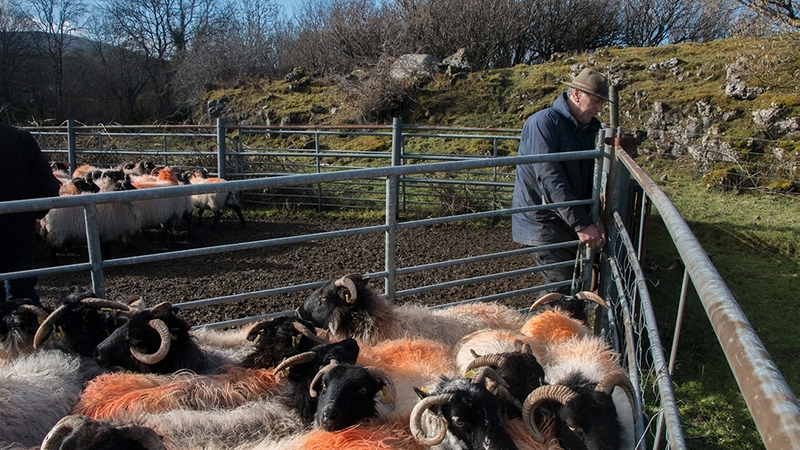 Nearly 80 percent of Northern Irish farms are cattle and sheep businesses, mostly small to medium-size. “Each animal is worth around 80 pounds ($105), and the levy would be half of that,” Ivor Ferguson, the president of the Ulster Farmers’ Union (UFU), told Al Jazeera. With less than a month to go before Britain’s scheduled departure from the EU, the thorny issue of the future of the Irish border continues to jeopardise an orderly divorce. Before the 1998 Good Friday Agreement formally ended three decades of violent, sectarian strife in Northern Ireland, the Irish border was heavily fortified with military checkpoints that served as a physical reminder of the ideological divide between largely Catholic republicans, who want to reunite Ireland as one country, and mostly Protestant unionists, who want Northern Ireland to remain British. Both the United Kingdom and the EU are keen to avoid resurrecting a hard border in Ireland. But the solution proposed as part of Prime Minister Theresa May’s Brexit deal triggered a deadlock in parliament over the so-called “backstop” which would keep Northern Ireland within the EU’s customs and regulatory arrangements until London and Brussels reach a comprehensive trade agreement. Supporters of the backstop view it as a necessary insurance policy to preserve peace in Northern Ireland. Opponents see it as an unacceptable compromise which could tie Britain to the EU’s trade rules indefinitely. The Democratic Unionist Party (DUP), which May relies on to prop up her government, are also opposed to any measure which treats Northern Ireland differently from the rest of the UK. Business groups and organisations such as the UFU, which traditionally represent a unionist base, have publicly expressed their support for May’s deal while calling for parliament to endorse it. The prospect of pushing back the Brexit deadline, which has materialised in Westminster, is of little comfort. “We would like to see the withdrawal agreement signed off so that we can move on to the more important job of working out what our relationship is with Europe in the future. That’s the main job for us,” Ferguson said. Amid concerns that the return of a “hard border” in the form of checks and physical infrastructure could lead to violence, Westminster has been looking at “alternative arrangements” to avoid physical infrastructure on the border. That could present significant challenges given the high level of cross-border integration in the sector’s supply chain, which could see products crossing the border more than once on the way to being processed and packaged. In the absence of guarantees from the government, Sheridan – whose farm counts 500 sheep and 200 cattle – says the best bet is to downsize. “[We’re going to] sell off two-thirds of the [cattle], and see what happens. But the sheep are different. They were born and bred for this type of terrain. I’m stuck with the sheep,” he sighed. Northern Ireland currently sends most of its beef to the UK, but Sheridan is concerned that small, local producers like himself could be undermined by laxer regulations on food imports. Last week, the US published its negotiating objectives for a trade deal with the UK, which include removing barriers on sanitary and phytosanitary standards. Local producers are concerned that local markets will be awash with chlorinated chicken and hormone-fed beef if Britain’s consumers choose price over quality. Northern Irish farmers are also highly dependent on the much-criticised EU farming subsidy system to survive, with farmers often making more money from grants than from agriculture. While Brexit is seen by some as an opportunity to reform the system, farmers like Sheridan remain concerned. The UK has allocated 4.2 billion pounds for Brexit preparations since 2016, some 2 billion of which is earmarked to prepare for a no-deal scenario. But a recent impact statement released by the government warned that leaving the EU without a deal could leave the UK economy up to nine percent weaker in the long run and “affect the viability of many businesses across Northern Ireland”. There are also concerns that the demise of local agriculture could have environmental consequences. “We use cattle to graze a lot of our protected sites,” John Martin, a conservation expert at the Northern Ireland branch of Royal Society for the Protection of Birds (RSPB), told Al Jazeera. On the other hand, experts, including Martin, say the EU’s common agricultural policy has caused environmental degradation in the UK as a whole, favouring large landowners and incentivising the clearing of land for it to qualify as farmland. The UK government’s 25-year plan for the environment, published in January, does not apply to Northern Ireland because it currently doesn’t have a sitting government. It remains unclear, Martin said, how struggling businesses are to cope with any new policy that will be introduced.